Copyright: © 2019 Thong G, et al. This is an open access article distributed under the Creative Commons Attribution License, which permits unrestricted use, distribution, and reproduction in any medium, provided the original work is properly cited. Acute dizziness/vertigo is among the most common causes for visiting the emergency department or primary care physician. Although the majority of these presentations represent an acute peripheral vestibulopathy (APV), lateral medullary, lateral pontine, and inferior cerebellar infarctions can mimic APV very closely. We present an atypical presentation of an aggressive APV and outline how a well-constructed bedside neurotologic evaluation can distinguish central from peripheral vertigo in the acute setting. A 39-year-old female was referred emergently to the ENT service with a week-long history of disabling vertigo and imbalance. This was constant in nature and associated with severe nausea, gait instability, and nystagmus, compatible with acute vestibular syndrome. She had a history of a right canal wall up mastoidectomy nine years previously for cholesteatoma. Tympanic membrane and external auditory canal (EAC) examination bilaterally were normal. There was horizontal spontaneous and gaze nystagmus with the fast phase to the left. This was a second degree nystagmus that obeyed alexander’s law, without changing direction when looking towards the slow phase. Head-impulse test demonstrated an abnormal vestibulo-occular reflex (VOR) to the right. There was no skew deviation on alternate cover testing. The patient could not walk unaided and Romberg test was positive. A CT temporal bones and brain was performed urgently. This revealed a large soft tissue density in the right mastoid with an aerated middle ear. There was erosion of the lateral semi-circular canal and the bone overlying the horizontal segment of the facial nerve (Figure 1). There was also significant erosion of the tegmen tympani and communication with the middle cranial fossa (Figure 2). An examination under anaesthetic (EUA) was performed and a defect was palpable in the posterior EAC. Incision of the mucosa over this defect confirmed the presence of keratin consistent with residivistic cholesteatoma. 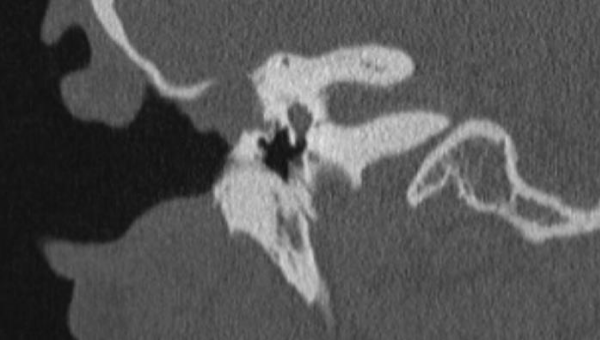 Figure 1: Coronal CT at level of middle ear. 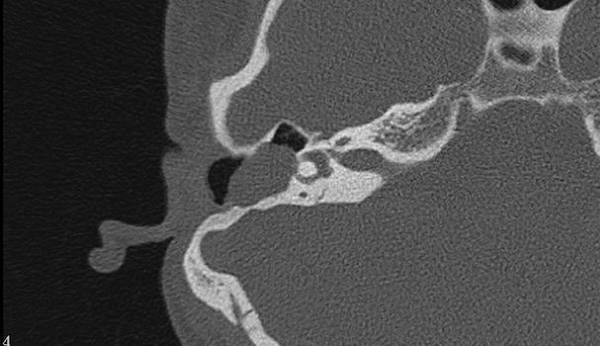 Figure 2: Axial CT at level of inner ear. A right modified radical mastoidectomy (MRM) was performed which revealed extensive cholesteatoma, most likely arising from the posterior canal wall, filling the mastoid bowl and antrum eroding the tegmen tympani and bony horizontal semi-circular canal. The defects were repaired intra-operatively and post-operatively the hearing was preserved. Her vertigo and nystagmus gradually improved in the early post-operative period and she underwent intensive vestibular rehabilitation. The rates of recurrent or residual cholesteatoma range from 5-70% with a multiplicity of factors affecting recidivism. Cholesteatoma is largely a clinical diagnosis which generally presents with a discharging ear and keratin visible in a retraction pocket or perforation. Our patient had a normal appearing middle ear but the severity of her symptoms, history of previous ear surgery and clinical signs pointing to a lesion in the her right semi-circular canal, meant we had a very high index of suspicion for active disease her right labyrinth. Vertigo and dizziness are common symptoms in both primary care and the emergency department (ED) and significantly impact upon a large percentage of the population. Vertigo is a false or distorted sense of self-motion and dizziness is disturbed spatial orientation without vertigo. Both terms refer to a multiplicity of various etiologies and pathogeneses . The vast majority of primary care patients with vertigo have benign paroxysmal positional vertigo (BPPV), acute vestibular neuritis, vestibular migraine, or Ménière’s disease . However, consideration should be given to potentially life-threatening disorders as a cause of acute vertigo. It is estimated that dizziness accounts for 4% of all Emergency Department (ED) visits and 3-5% of these presentations were patients with stroke. 35% of these strokes were missed compared to 4% of those who presented with motor symptoms . Distinguishing benign from more sinister or potentially life-threatening dizziness is especially important for front-line physicians. In contrast to traditionally held belief that dizziness or vertigo are usually associated with other neurological signs and symptoms in cerebrovascular disorders, vertigo and imbalance are recognized as the most common symptoms in vertebrobasilar ischemia , which comprises up to 20% of all ischemic strokes [5,6]. There no single diagnostic tool for most disorders causing dizziness. The diagnosis is largely based on a constellation of clinical features obtained with careful history taking and bedside examinations . CT scans have low sensitivity for acute infarction particularly in the posterior fossa and false-negative MRI can occur with acute vertebrobasilar stroke in first 24-48 hrs . Consequently, bedside predictors are essential to distinguish peripheral from central vestibulopathies. Kattah et al., described a three-step physical exam, the HINTS exam, which can differentiate between peripheral causes of vertigo and stroke with a sensitivity of 100%, and a specificity of 96%. HINTS stands for Head Impulse test, Nystagmus and Test of Skew . Head impulse test is performed by sitting face to face with the patient. Patients head is held in the examiners hands and the patient focuses on the examiners nose. The head is moved quickly about 10-15 degrees to one side. In a patient with normal vestibular function, the VOR results in movement of the eyes opposite to the head movement - essentially the eyes stay fixed on the nose throughout. Impairment of the VOR is noted when the eyes move off target and a voluntary saccade is observed bringing the patients eyes back to target after the head movement. Peripheral vestibulopathies are generally associated with a characteristic, dominantly-horizontal nystagmus that beats only in one direction and increases in intensity when the patient looks in the direction of the nystagmus fast phase. Purely vertical or purely torsional nystagmus are almost always due to a central pathology. Most strokes presenting with acute vertigo have nystagmus with a predominantly horizontal vector. What distinguishes the nystagmus of central from peripheral vertigo is a change in direction on eccentric gaze . Lastly, Test of Skew deviation is a sign of posterior fossa pathology. It is performed with the alternate eye cover test. While sitting again face to face, the examiner asks the patient to look straight ahead while alternately covering one of the patient’s eyes at a time. If abnormal, the covered eye will deviate downward and when uncovered will make a corrective saccade upwards. This case highlights an important differential diagnosis of acute vertigo in a patient with previous mastoid surgery, even in the presence of a normal tympanic membrane examination. Vertigo in the presence of recidivistic cholesteatoma is an indicator of aggressive or advanced disease and requires urgent ENT assessment. Secondly, for those in primary care or emergency medicine, the HINTS examination is an easily remembered and invaluable triaging tool in patients who present with acute vertigo.